Bookshelf, Surround and Bipolar SpeakersElevate your home audio experience to another level by immersing yourself in high fidelity sound. Fluance offers 3 formats of compact speakers: bookshelf, traditional surround sound, and bipolar surround sound. 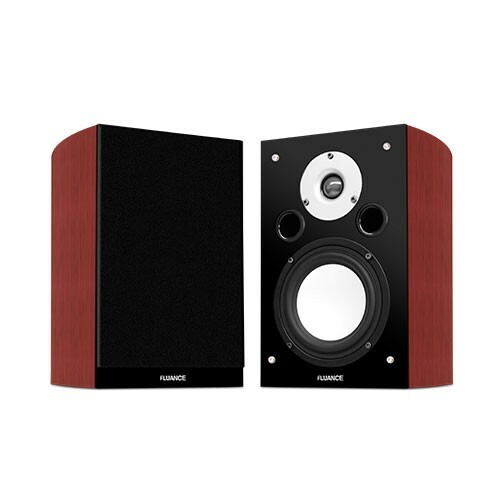 To be enjoyed in a stereo 2.0 channel speaker system or as part of a complete home theater surround sound setup, either as front main speakers or rear surround speakers. What Does Each Channel in a Surround Sound System Do? When developing our bookshelf speakers we use the same design principles found in our high fidelity floor standing speakers. Not only do they function as main front speakers but also as rear and side surrounds. In addition to home theater applications, bookshelf speakers perform flawlessly with a turntable and amplifier to achieve a complete, sophisticated and compact system that doesn’t sacrifice room-filling sound. No home cinema experience is complete without the addition of 2 rear or side surround speakers. They immerse you in the movie by producing lifelike directional effects. Visualize a raptor rushing by, or an Indy car racing past you. Add 4 surround speakers to your Dolby or DTS home theater system for an even more immersive and exciting effect. Want overhead sound effects? Include a pair of additional speakers installed in an upward firing configuration with Dolby Atmos receivers. Widespread, enveloping surround sound throughout your entire room. The unique bi-directional design of bipolar speakers produces a larger three-dimensional soundstage than conventional surround sound speakers. This is achieved with drivers on opposing sides of the cabinet allowing an ideal mix of direct and indirect sound.